Two pineapples found washed up on Meal beach on Shetland. picture by Zoe Henry. 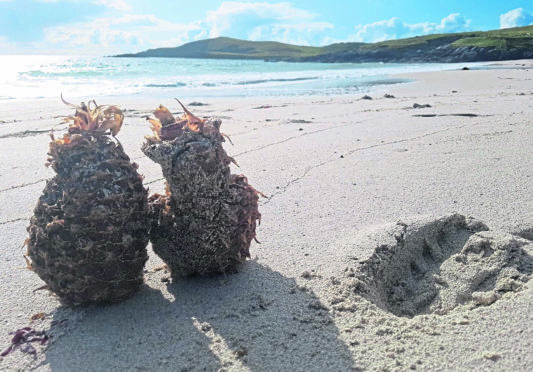 Beaches in Shetland are turning tropical after pineapples started washing ashore – some 10 months after large containers carrying the fruit were lost overboard from a cargo ship in the Atlantic. Islanders were initially shocked to discover “shrivelled-up” pineapples appearing on the west coast of the islands. But then it transpired that the crew of the 16,000-ton Maltese-registered cargo ship Lombak Strait, used by fruit giant Del Monte and travelling from the Panama Canal area of South America to Dover, reported losing two 40ft containers with pineapples and bananas had been washed overboard in bad weather. Pineapples were this week found on Meal Sand Beach in Burra and Watsness, near Walls. Zoe Henry, who made the Burra discovery, said: “I was a bit shocked to find the pineapples on the shore. “I thought maybe people were having a picnic but they were whole and soggy, shrivelled up and I think they had been battered in the sea by looks of them. Dr Andrew Dale, of the Scottish Association for Marine Science in Oban, said of the modern-day Whisky Galore: “Although these pineapples washing up on the shores of Shetland will be an unusual sight, it’s not hugely surprising that cargo lost to the Atlantic has reached us. “The water we see to the west of Scotland and up to Shetland has crossed the Atlantic, starting out as warm ocean currents in the Gulf of Mexico and eventually reaching the Arctic. It’s a huge transport system that crosses the globe. A spokeswoman for the Marine Coastguard Agency said: “Just after 11.10am on October 22, 2017, a vessel contacted HM Coastguard to let us know that it had lost two 40ft containers with pineapples and bananas in it during bad weather. “There was no specific location given, just the Atlantic. The vessel was heading for Dover. Last year, the Lowestoft-based Centre for Environment, Fisheries and Aquaculture Science (Cefas) had appealed for reports of a fruit cocktail washing up, expecting the cargo to come ashore once the containers broke up.